This insane, for P200 you get unlimited text and 4 hours worth of calls to fellow sun cellular subscribers and 1000 text to other networks. For 30 days!! 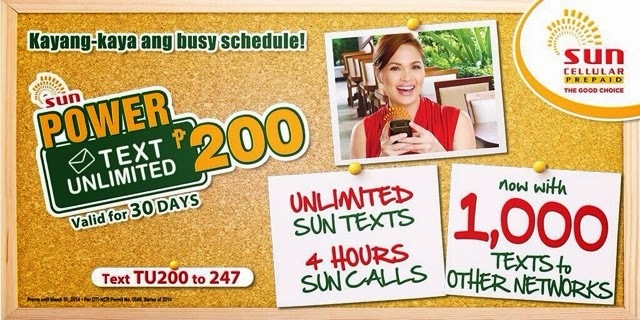 That unlimited sun to sun text i believe is enough to justify the P200 pesos but with additional 4 hours of call and a thousand more text? Thats already a steal! This might sound an advertisement for sun but no, i just cant really believe it. Might be because i'm paying 1799 or more to Globe monthly haha. This is a promo and until mar 31, 2014 only. is this promo still valid? yes. promo is still valid. it has 5 hours calls to smart and sun. also includes free access to messenger apps like viber, wechat, etc. does not include skype though. pwede rin po ba tumawag sa smart kapag eto po load nyo? pero wala na po yung accumulation pag every month ka mag load diba po? free fb access sya dba ?? Is it still available up until now? Thank you. I have a question. is it possible to register in BIGTIME DATA 70, if my load is TU 200? How to check TU200 STATUS? Globe Telecoms merging with Bayan ?